Cannons on the ramparts of Quebec city. Unfortunately, trees have grown up pretty much obscuring the view of the St. Lawrence. Click here to view other Monochrome pictures this week. So other-century-like. The range of color is great. That black hole at the end of the cannon says it all! Look out, here we come. Boom. Nice shot! Love the perspective. Black and white match with cannons - superb photo! Not much you can do about the trees, but great shot of the front cannon. I am having a book association time of it - now it is C.S.Forester and 'The Gun'. Like the row of cannons. A nice shot in mono. Can I ask you how you get the labelcloud to your blog? I would like to have one on my blog too, but I don't know how to get it. Beautiful shot. 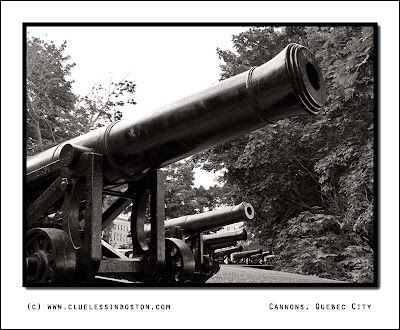 Love your angle of approach to those cannons and your choice of b&w. Nice one. Also a taste of what I'll see in three weeks! I think it's perfect my dear friend!Adorable shot! Nice monochrome. I'd say you got a lot of bang for your buck! Great perspective. A few rounds out of the cannons might restore the view of the St. Lawrence? I love the angle you've used and the framing is perfect. Beautiful shot. Thanks for the welcome, and for stopping by at mine. I wonder what it's aiming at!? Thanks for visiting my MM! Nicely done. Isn't Quebec City a great place?